It was the morning after Ms Sassy's Fabulous Birthday Dinner on the patio at Craft, when I thought I couldn't possibly stuff any more deliciousness into my now ground-hugging muffin top, that Ms Sassy and I met up once again in the name of good food - to burst through the doors of Lucques like a bunch of cowgirls in defiance of the law (well, laws...of gravity and waning metabolisms). Lucques was having their annual Rib Fest (4 meat courses, 5 sides, 1 dessert, $55pp), which seemed the perfect reason for a mid-summer chowdown, despite our culinary debauchery just hours ago. Afterall, Rib Fest only comes around once a year. And it falls on the day after Ms. Sassy's birthday so that I could treat her back, for the fantastic fete she hosted the night before. The thing we learned immediately about Rib Fest is that Lucques does not mess around with their meat extravaganza - in mere minutes after being seated in the properly dressed, hay-strewn back patio, our food started arriving. Makes sense since there is only one menu offered, that everything is ready to go and there's no lag time with decision making and prep. The entire staff was game for the themed event and seemed to get into character with their western shirts, cowboy hats & boots, and I thought I even spotted a string tie at one point. Everything pretty much arrived at once, but the center piece of course was the mountain of animals corralled onto one plate. 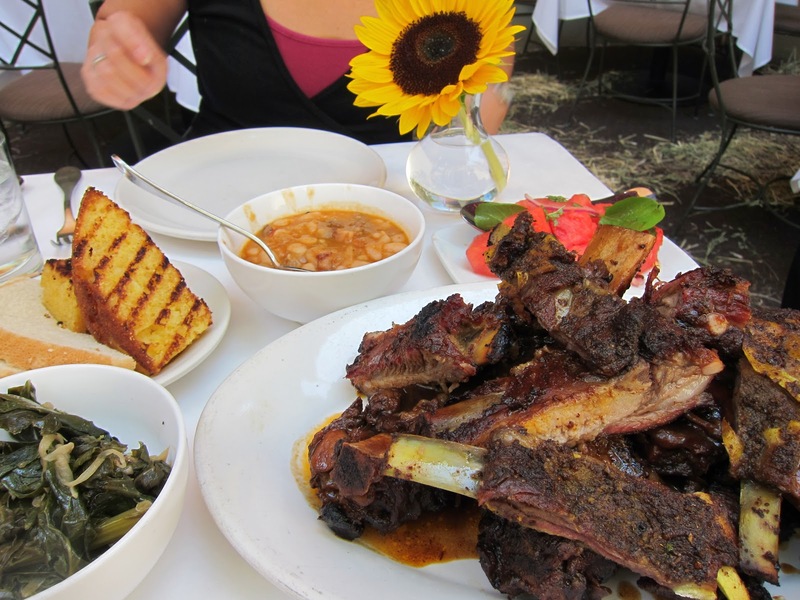 It was a representative roundup of Saint Louis-Style Pork Ribs, Braised Beef Back Ribs and Spiced Lamb Spare Ribs, which our server told us had been slow-cooked for hours. And it showed - the ribs were all soaked through with flavor to the bone, and when meat and teeth made contact, the meat fell away like the slow-drawer. My favorite of the ribs was of course the lamb - not many places, at least that I'm aware of, does lamb at an 'all-american' style bbq! There was so much meat we each took ribs home in boxes. The fourth protein was Too-Hot-to-Handle Chicken Wings, which were basically buffalo wings but with a nice crisped skin. 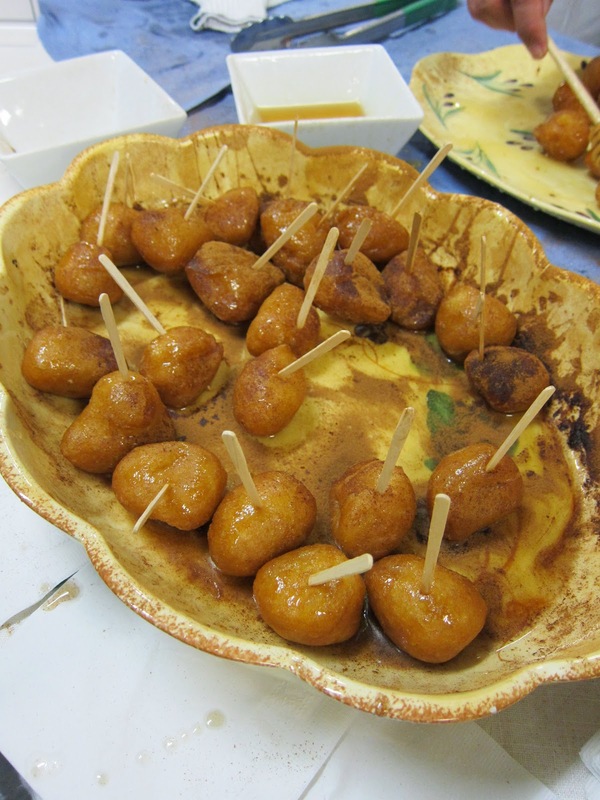 These were aptly named - the heat was too much for me and I could only manage a few bites. fresh, but I was a little disappointed that they didn't get the Suzanne Goin treatment I looked forward to - of being elevated with her interpretation or mixing with unexpected ingredients for new flavor profiles, while allowing the natural, clean tastes of the ingredients to shine through. The last two sides were what really stood out and blew me away: Grilled Cornbread (the better half of the Grilled Cornbread & Wonder Bread plate), and Watermelon and Lime Salad. The cornbread didn't have any added ingredients or contrived fanciness to it - it was simple, rustic, comforting, the way cornbread should be served - but the grilling added a nice pungent smokiness and crunch that worked perfectly with the fluffy cornmeal interior and took it to a whole different level. A little over a week later, and I can still taste and crave it. 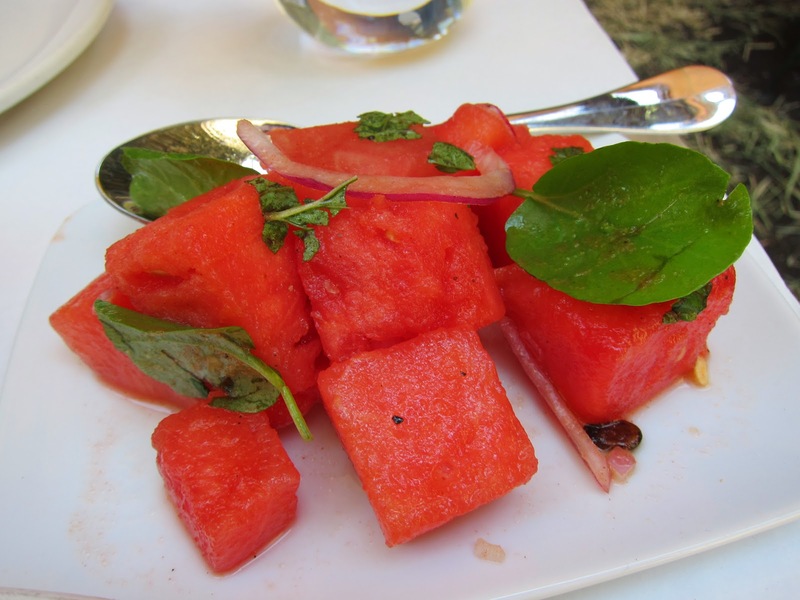 The Watermelon and Lime Salad was the second standout among the sides - the ingredients were kept simple and clean, but worked perfectly together: juicy watermelon chunks were tossed with lime, red onion and herbs to form an instantly addictive, refreshing summer salad. 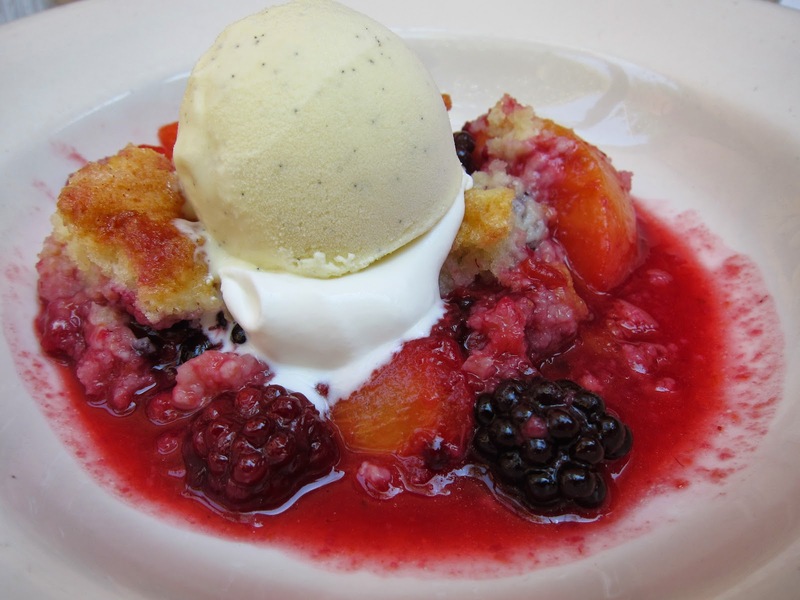 For a sweet finish: Peach and Blackberry Cobbler with Vanilla Ice Cream. This was a great counterbalance to the savory feast, with market fresh berries plopped among a light spread of cakey crust, topped by a cool scoop of vanilla ice cream. We left satiated and contented. 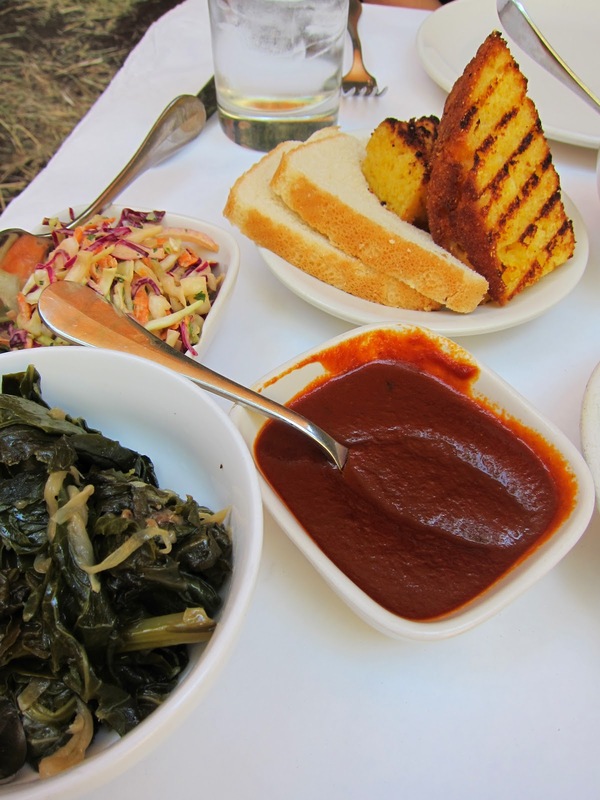 All in all, a solid meal for those who don't want to get down and dirty with their own barbecue grill, and want to enjoy their carnivorous feast in a civilized, upscale yet not stuffy environment. Would I come back next year? I was glad we got to try it, but for my money - especially since I am not a huge barbecue fan (don't get me wrong, I love my meats fresh and sizzling off the grill, but I don't often crave it - with the exception of korean bbq) and almost always prefer the unexpected versus classics, and especially since it's at Lucques - I would rather put my money towards Lucques Sunday Suppers (3 courses, $45pp) where I could experience the more creative and inspired dishes coming out of the chef's kitchen. That said, it was still a great bbq meal and glad I got to play a part in extending Ms. Sassy's bday weekend festivities! DIY Watermelon Rind Pickles 2 Ways - Recipes from Eat Real Fest! One of my favorite things from Eat Real Fest 2011 was the DIY workshop where we learned to pickle watermelon rinds! The jars were a visual feast: chunks of pale green rind with just a blush of pink, floating in brine punctuated by wheels of jalapeno and balls of peppercorn, tinged with lime zest. Was really sad to have dripped all over my recipe from the event so don't have that exact one anymore (if you went to the event and have a copy, please let me know!). But we managed to pick up two other watermelon rind recipes from the workshop organizers - both look delicious. Thought I'd share below - may they provide inspiration as you head to your local farmers market this weekend! First, create your brine by adding vinegar, water, salt, sugar, mustard seed, peppercorns, and onion. Bring to a boil over medium heat. Let cook for about 5 minutes. Add rind and bring to a boil, cooking for another minute. Add half a clove of garlic to each jar. Spoon hot ingredients into jars and top off with brine to about 1/2" from top of jar rim. Place lids on jar and cool in refrigerator. 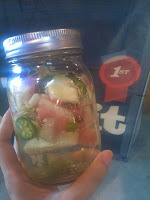 Let pickles marinate for about 1 week before eating. Keep refrigerated at all times. Lasts 3-6 months in refrigerator. These pickles have a spicy Asian flavor that goes well with most Asian foods. Try it with some Satay or curry. Add vinegar, water, sugar and gingerroot in a large pot and bring to a boil over medium heat. Add rind and bring to a boil for about 1 minute. Place one star anise into each jar. Spoon hot ingredients into jars and top off with bring to about 1/2" from top of jar rim. Place lids on jar and cool in refrigerator. Let pickles marinate for about 1 week before eating. Keep refrigerated at all times. Will last 3-6 months in refrigerator. 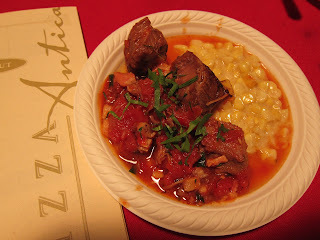 Eat Real Fest - OFF (Organized, Free, Fun) the Hook! 'Carmageddon' turned out to be the best thing to ever happen to people who like to be out and about in Los Angeles - regardless of 'little' obstacles like possible doomsday style traffic congestion. As warnings for the masses to keep their vehicles off the streets last weekend worked their magic on most of Los Angeles - those of us ready to pursue good eats, and great fun, no matter what it took, lucked out with a utopic state of free reign over the city's uncharacteristically clear roadways. Although the closure of the 405 freeway should have impacted us San Fernando Valley dwellers the most - especially when trying to get to the Westside - emboldened by the clear streets on Saturday and armed with my handy free Waze app, I decided to take a chance Sunday and head down to Culver City for the Eat Real Fest. It was the least traffic I have ever encountered during normal waking hours. And everything ran perfectly from there. I was impressed immediately with how well the event was organized, especially for its inaugural year in LA. There were clearly marked maps of parking lots, and school buses serving as shuttles with frequent pickups throughout Culver City. At stops clearly marked with ERF signage. And all info was posted on the site for easy access well before the event date. All this for a festival that is FREE to attend - yes, FREE - and food for purchase at $5 a plate. I had been excited about this event from the minute I first read about it - it was to be a celebration of food in all the glorious ways that we interact with it, bucketed into 4 key categories: Eat, Drink, Make and See. Not only were there gourmet food trucks (which are ubiquitous nowadays) but DIY workshops, talks and demos where you can learn everything from how to raise your own bees and chickens, growing your own mushrooms, making your own kimchi, to how to butcher whole pigs and smoke them at home. It sounded like a fun weekend of tasting and learning - and as you'll see below it by far exceeded all my expectations! EAT/DRINK: Since I had the Extravaganza for the Senses event to go to Saturday, that left Sunday for ERF. My friend 'Designer' lives within walking distance of Culver City, spent all day Saturday at ERF - and liked it so much that she wanted to go back Sunday. So she became a great tour guide for our group, making sure we took a strategic approach to maximize our experience: like hitting the Carlsbad Aquarium booth before they run out of their fresh shucked Luna oysters. We only felt the slightest tinge of guilt, for all the shucking the owners had to do, when we ordered a dozen oysters EACH (3 for $5, 8 for $10, 12 for $18. So I guess the $5/plate price was the 'starting' price, which makes sense. Still a great deal). 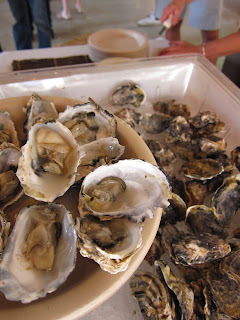 We got over the guilt quickly though as we tasted the incredibly fresh oysters - which one owner described as 'more briny than other oysters, with a bit of melon-like flavor'. The first part was definitely spot on, but personally we could not really taste anything that resembled melon (which was good, we didn't really want any sweet flavors with our oysters). It probably took the owners 10 minutes to shuck two dozen oysters for us, and about 2 minutes for us to scarf the plate down whole. The ERF was spread throughout the Helms Bakery space, and had a great flow where sections were broken up into digestible bites. So after oysters, we walked around the stalls in the immediate indoor space, checking out all the cool small batch, local producers - everything from spicy pickles to infused kombucha (fermented tea that tastes vinegary) to Jamaican Jerk sauce. In the outdoor sections were gourmet food trucks, beer gardens, a farmers market style stand offering stone fruit (bought some amazing pluots!) and stages with various musical performances or food demos, with giant haybales for seats. At around 11am, at the Main Stage they had burlesque and salsa dancers - it was an unexpected thing to do so early Sunday morning, which sort of added to the charm of the performance and the randomness made it all the more fun and amusing! 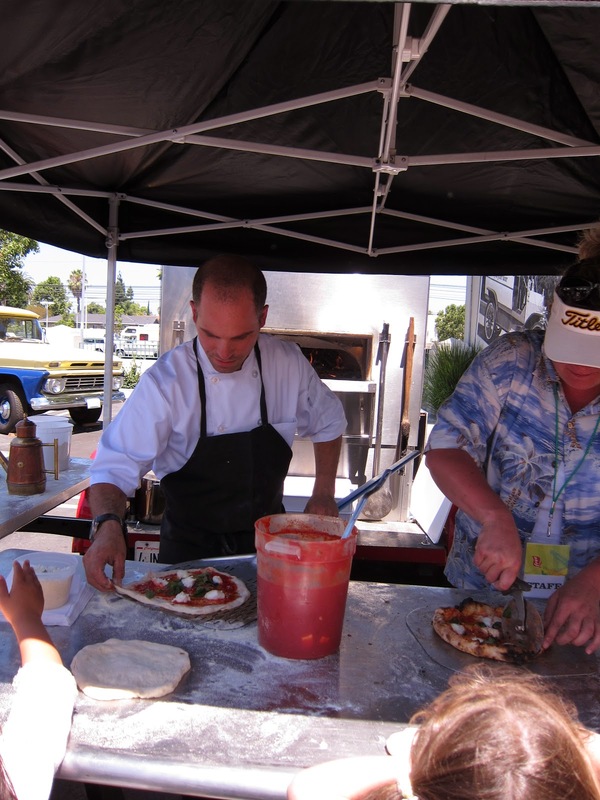 One of my favorite outdoor demos was from Olio Pizzeria's Bradford Kent, who brought a mobile wood-burning oven (yes, you read that right), and demonstrated how to make pizza from scratch - offering of course then his fresh from the oven margherita pizza for guests to sample. 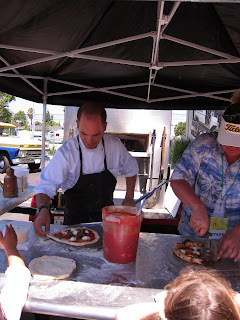 He also generously offered a home-cook version of his dough recipe to anyone who was interested - I can't wait to try both the recipe, and other pizzas at the restaurant! MAKE: Which brings us to another key bucket of activity at ERF: DIY workshops. 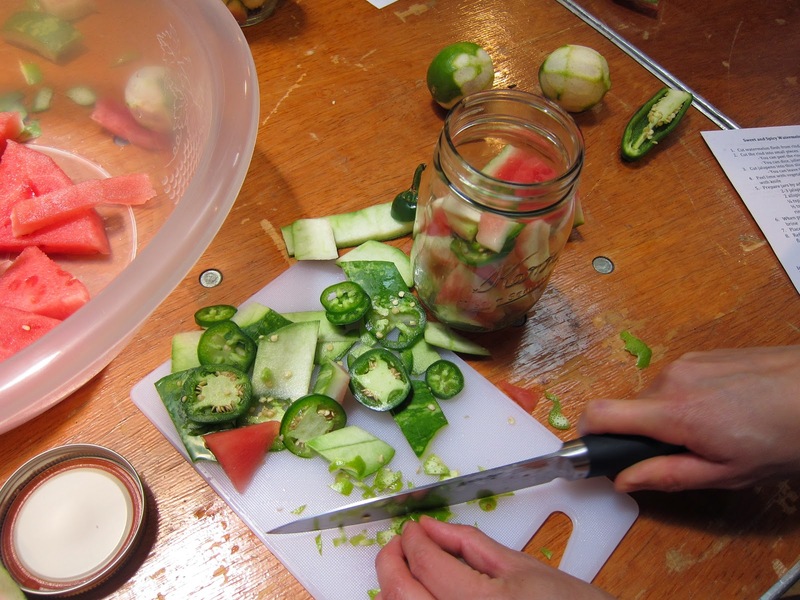 The ones we attended were tons of fun - starting with the Watermelon Rind Pickling workshop - where we got hands-on to create jars we could take home. Ours turned out pretty gorgeous, if we do say so ourselves. I will share the recipe in a separate post, to prevent this one from going novel-length! There was also a pesto-making class, but I figured that would just be a lot of chopping, so we skipped in favor of seeking other eats. Later in the afternoon, we checked out the Bitters class and learned about their history, how to make them at home, and of course had some handcrafted samples from our 'trainer'. I thought the class was interesting, though I didn't have the taste buds to appreciate bitters outside of cocktails - it all tasted a bit medicinal, and um, bitter (duh!) to me. Other sights to see were cute farm animals from ducks to chickens to piglets, and various herbs and veggies planted in the display gardens. Oh, and live bands on two stages throughout both days! Last thing I want to mention: I really have to say event organizers did a stellar job with infusing every element of the event with a consistent message: support the local, sustainable, green and eco-friendly. There were the suggestions and incentives for alternative transportation, like bike valets and free shuttles. There was a 'Zero Waste Zone' and recycling stations everywhere you turned. 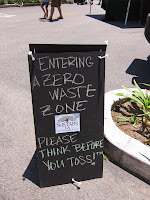 Not only were the recycling stations split by compostables, landfill items and recyclables - there were volunteers manning each station to tell you which bin to put each type of trash in - so that it became a point of interactive learning as well. The event not only promoted a 'nose to tail' philosophy, but walked the walk with a 'farm to finish' approach to the experience as well as sort of educating people about how they could go green at the event. All in all, one of my favorite events of the year and by far my favorite FREE event. I loved that they had guest relations people on site taking surveys to get an immediate read on people's experience of the event, and asking questions about improvements they'd like to see - mad respect for that approach! My answer to the improvement question: have more beverage sampler stations (to mirror the amount of food being sampled) and to hold this event more often!!! ERF, hope we'll see you again very soon!!! With all the 'Carmageddon' warnings for the masses to keep their vehicles off the streets last weekend, most of Los Angeles heeded the doomsday style appeals - making it Autopia for those of us senseless daring enough to venture out. There was lots going on in the city that weekend, and I was not going to miss out just because of the possibility of traffic (disclaimer: yes, it might have been easier for me to say as I live in the Valley and can either detour via more eastern routes to get down to Hollywood / mid-city or park & ride the Metro down). The first event I was glad to be able to make it to, was Extravaganza for the Senses, a food and wine focused event benefitting The Saban Free Clinic, which has been providing free health care to the Los Angeles community since 1967. Forty mid to high end restaurants and dozens of wineries gathered at the Sunset Gower Studios in Hollywood for the event, to the tune of $100 for General Admission and $225 for VIP early entry, valet parking and access to the exclusive VIP Lounge. I attended not as guest, but contributed as a volunteer working with a friend I'd made at another event - and this turned out to be one of the most rewarding experiences of the year for me all around. I got to see behind-the-scenes, of strangers coming togehter for a good cause, pouring their efforts wherever it's needed to get the venue set up, whether it's manual labor (like transporting 10 pound bags of ice down the backlot in golf carts!) directing traffic or putting plates and glasses together to hand to guests. I also loved seeing the comraderie between vendors as they came together on a Saturday night to offer their wares, generously donated to the cause - some even shared their supplies with others who had forgotten service items. There was also a silent auction with everything from travel packages to bottles of wine donated by vendors. All in all, a great event that I will personally look forward to making an annual outing. New friendships were forged as everyone pulled together to make the event a success, all ultimately to give back to the community. It was a moving display of selflessless, that served as such a positive counterpoint to all the negativity of a car-centric city that had been made irate by the 'threat' of individual inconvenience that weekend. Next year, Carmageddon The Sequel or not (I say bring it on, this year's Carmageddon was the best ever for those of us willing to risk getting behind the wheel) - I most definitely will consider this an event not to be missed. For those who attended / are planning to attend next year: Know that not only does the price of admission goes towards a good cause - health care for those who cannot afford it - it's also tax deductible for you. According to the event site: The price you pay over and above the fair market value of the ticket is a charitable contribution and is tax-deductable to the fullest extent of the law. See site for more details. Flying Pig Cafe $25 for 2 hours of all you can eat buns, tacos and beer - deal from Thrillist LA (less than 15 days left to buy). Also $55 for "Boozy Dinner for Two" - see website for details. "TheJGold" is presenting LA Weekly's First Annual Pancake Breakfast! FIG, Dupar's and Warszawa are among the restaurants scheduled to participate. Check out the full list and more event details at: LAWeekly.com! Ever wondered why there is a faux retro gas station in front of the Farmers Market at The Grove? I've passed by it many times but just took it for granted that it was another 'set' piece to add to the ambience. It wasn't until this past Tuesday that I learned some of the history behind the market, while attending the Taste of Farmers Market event in celebration of its 77th anniversary. Yes, it all started back in 1934 - and is a great story of imagination, possibility and happy happenstance. The Gilmore family had landed the property on 3rd and Fairfax through a drawing of straws, used it as a dairy farm until they discovered oil when drilling for water for the herds, and over time allowed a pair of entrepreneurial spirits to make use of a vacant lot nearby to have local farmers come to sell fresh produce off the backs of their trucks. Farmers would pay just 50 cents back then to rent a space to park their truck and sell their wares to local shoppers. The concept was an instant hit, and within months they were building structures to house merchants and facilitate visits from the crowds. I've always enjoyed The Original Farmers Market - with its laid back and authentic vibe in contrast to the relative opulence of The Grove next door. Part of the charm of the place is its no-fuss atmosphere, and welcoming of people from any and all walks of life. It's sort of the great equalizing space in the midst of the ostensibly higher-end stores at The Grove. And that applies to both vendors and patrons - on any given day you can take your pick of anything from Spanish to Singaporean to French to Italian to Greek to Brazilian. You can arrive in your suit or your flip flops - and feel equally at home. Is it fine dining? No, and that's not the point of the market (see origins of food stalls noted above). 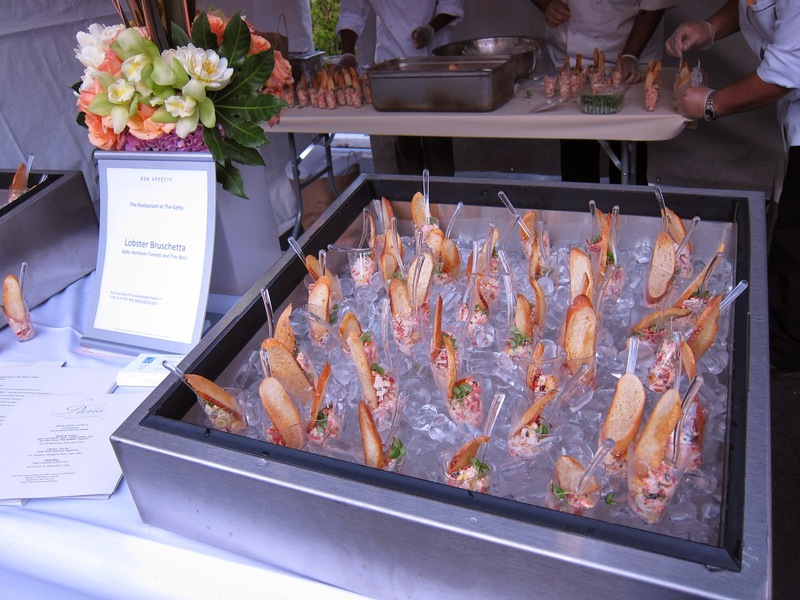 The Taste of Farmers Market event on July 12th offered the public the rare chance to sample from almost all of the vendors at the market, AYCE style, for one price ($35 per person for unlimited tastings, $45pp to add 2 wine/beer tickets). It had been a challenging day at work, and I arrived with only an hour left to go in the event (the event ran 5-9pm and I got there at 8pm!) - so I was grateful when the organizers were kind enough to provide a media pass. Some of the highlights from the event reflects the diversity of the offerings of the market: Loukoumades fried dough balls drizzled with honey, from Ulysses' Voyage, turkey or nutella crepes from The French Crepe Company, Chicken Mole Taco from Loteria Grill, Patatas Bravas from Little Spain, Brazilian sausage, sirloin cap and plantains from Pampas, Pain a la Tomate, and Chocolate Mousse with Glazed Raspberry from Monsieur Marcel (one of my fav spots in the market) and english toffee from Littlejohn's English Toffee. I missed but would have liked to sample the gumbo and cornbread from The Gumbo Pot. I had actually rarely ventured to the back aisle of the market, and was excited on this night to see that the Singapore Banana Leaf stall serves Laksa - they were not sampling that dish that night, so I made a note to return the next time I'm at the market. 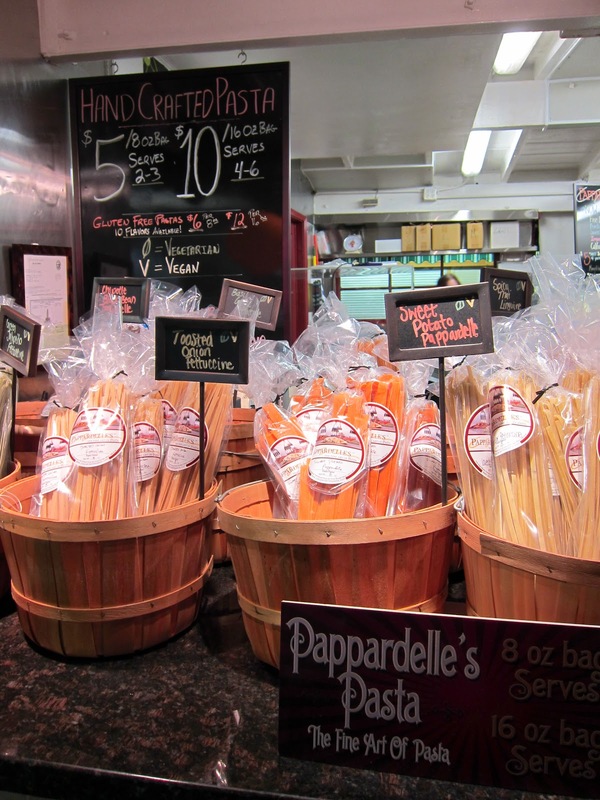 The market also offers dry/frozen goods including an interesting stall called Paparadelle's Pasta, a company based out of Colorado that offers hand-crafted gourmet pastas that are frozen to maintain freshness. Some of the mouth-watering and original pastas I saw there included Spicy Red Hot Thai Curry Orzo and Sweet Potato Paparadelle (8 oz bag for $5). 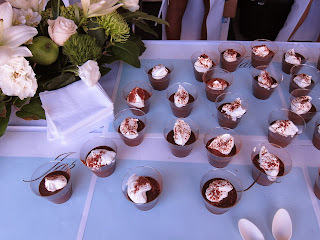 And of course, the chocolate pasta that they sampled at the event, which was made into a 'pasta sundae' with whipped cream. It's a concept with flavors and textures that take getting used to, but I respected the risk-taking and envelope-pushing. They also sampled and orzo salad which was delicious. 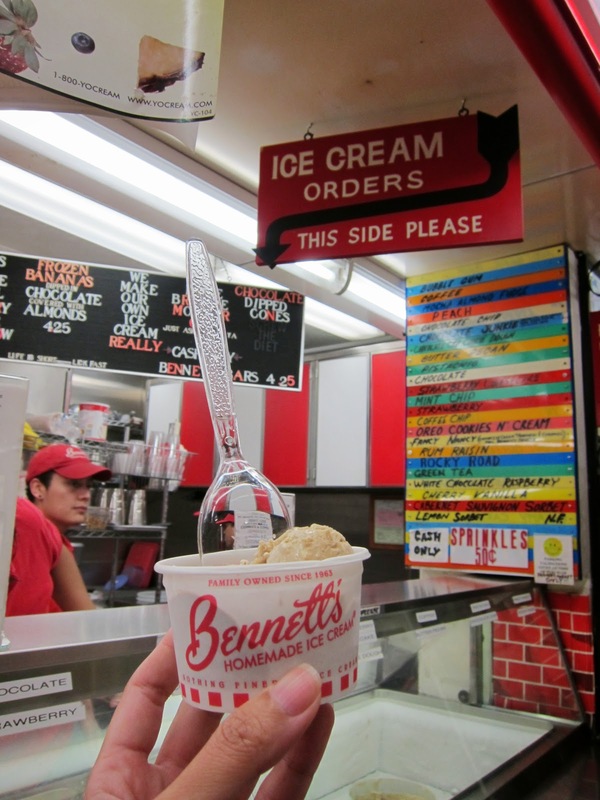 As one of the vendors that have been there it seems, forever, Bennett's Ice Cream is made fresh on the premises and has been a staple at the market since it opened. For the event, they offered two scoops with any flavor of your choice. I opted for the Chocolate Junkie and Fancy Nancy (coffee banana and caramel) - both were smooth and 'real' - like only old-fashioned hand-crafted ice cream can taste. A charming thing about Bennett's is that you can actually watch them mix their ice creams through the window into the open kitchen. In addition to tried and true staples, the market occasionally introduces its fans to newcomers - and at last Tuesday's event, they previewed a vendor that will be coming soon to the market: Short Order, a partnership between Nancy Silverton (of Mozza fame) and Amy Pressman, which will be focused on burgers. 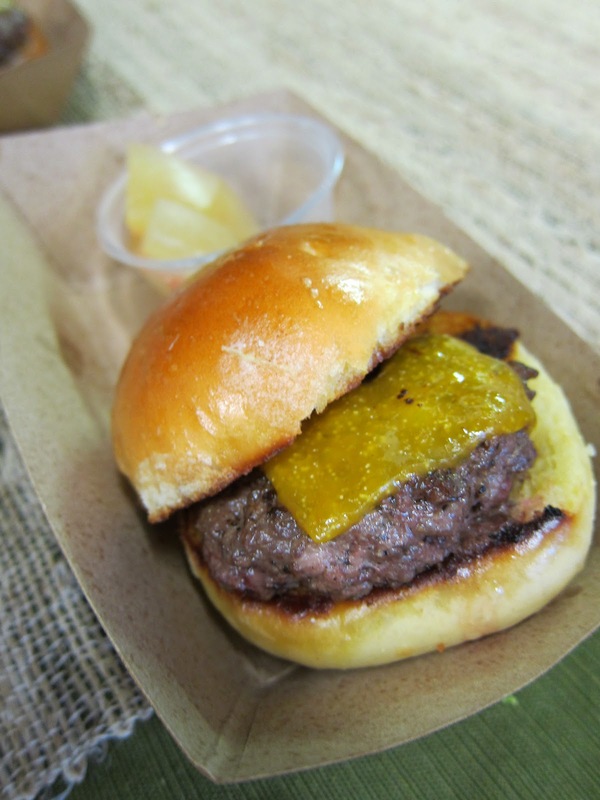 Short Order easily had the best savory food sample at the event in my opinion, with a Mac 'N' Cheese Burger - a little slider served with a side of watermelon rind pickles. They actually ran out of mac n' cheese by the time I got there, so I didn't get to try that topping, but the slider itself was still delicious - served at just the right temperature, with a tender, juicy patty embraced by the fluffiest hot brioche buns - it may have been a small bite, but it was packed with lots of promise for the upcoming launch of the gourmet casual restaurant (the girls at the table said September!). Sign up at their teaser website to receive info on the upcoming opening! In addition to the samples from food vendors, the market also offered samples to take home from stickers to treats for four-legged friends from Three Dogs Bakery (I picked up some cool "pup-cakes" for my friend 'Designer's fav pal, Stella). All in all, a great event that invited people to break out of their comfort zone and give all vendors at the market a chance - while some definitely stood out more than others, it was a great way to check out the wide range offerings at Farmers Market in one night, so that you can come back another time to get a fuller experience at the places that you liked. And just think - each time you dine at the Farmers Market you are not just fueling up, but partaking in a piece of LA history as well. It also doesn't hurt, of course, that it's also a good alternative to the pricier options next door - and serves as a great pit stop on the way to the movies or shopping excursions through The Grove, and/or a destination in itself for those on a budget, especially on Thursday/Friday nights during summer when free live music is offered from 7-9pm on the West Patio. For more Carmageddon deals check the special Carmageddon Survival Edition! This is meant to be an eashttp://www.bloomspot.com/los-angeles/the-edison-giveaway-1/?utm_source=eater&utm_market=la&utm_medium=email_dedicated&utm_type=sweepstakes&utm_subtype=edison&utm_campaign=20110712_edison_eater_la&utm_content=WinEveningAtTheEdison&utm_id=the-edison-giveaway-1ily digestible (yes, I did) report of third party offers - I am not the sponsor nor affiliated in any way with any of the companies listed above. I do not receive any payment for these listings. Please read offer details / official rules carefully before deciding whether to submit your information. Whenever I'm with my friend 'Designer', random but serendipitous things tend to happen to us. We don't necessarily plan for adventure but somehow end up on them. Back in May, on a whim we had gone to LACMA's annual Muse Art Walk - as we arrived fairly late in the day, we chose our first gallery for speed - because it was attached to the parking lot we pulled into. It happened to have a wine tasting table outside. At the time we thought, "cool, free wine, just in time before they call it a night!" - little did we know that was only the start of our next adventure. The company hosting the tasting was called Malibu Wines. 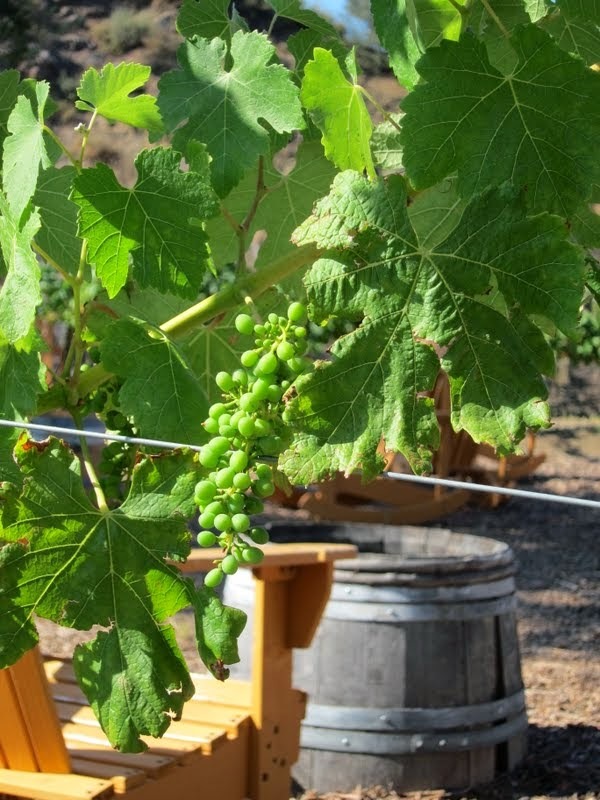 On a previous hike up Temescal Canyon, we had spotted vineyards on the hills overlooking the ocean, roughly in the Malibu area - but we thought those might have been private backyard wineries of the rich and famous. As if reading our minds, the friendly wine rep at Art Walk proceeded to talk about their tasting room up in the hills of Malibu, and that we should check it out sometime. In fact, she had tokens she was giving out for complimentary tastings at the tasting room! "Take as many as you want," she said, "it's the end of the day. Take some for your friends!" We actually liked the wines they sampled at the show, grabbed a few tokens, made a note to look up the place and moved on to the gallery. It wasn't until Designer's birthday came up this past week, and we were looking for a daytime activity to celebrate (before hitting the bars, wanted to make a full day of it!) that we remembered the tokens that had landed in our hands so long ago - and decided to use them for a mini staycation. We were excited to see that we could bring our own food to eat in their picnic area - as they do not have a restaurant on the premises, which was all the more appealing to us as we are both on a budget! So, first order of business was to pick up sandwiches and salads from Bay Cities Italian Deli & Bakery in Santa Monica - which was conveniently for us on the way to the PCH. Despite being a weekday, the deli was packed with hungry throngs of people, probably 6 deep, 4 wide by the deli counter - and since we were off to a late start due to pre-Carmageddon traffic, we opted for the pre-made sandwiches and salads. It was grab and go, then a straight shot up the Pacific Coast Highway to Malibu. Finding the winery was a bit of a process - the road up the hill, Mulholland - was a small street that didn't have an obvious sign and we passed right by it the first time. After getting up the hill it was another challenge to find the entrance to the winery - largely as we had been distracted by an amazing looking Tuscan villa atop a hill (we vow to go back to visit) and Malibu Wines had such an unobtrusive entrance, you wouldn't notice it unless you knew where to look (thank you, iPhone GPS!). As we finally set foot on the grounds of Malibu Wines, we were completely charmed. It was a cozy space with just a dozen or so tables out among olive trees and lush greenery, three open bar counters set into stone-walled buildings, with a giant vintage looking water/wine tower, vintage pickup trucks bearing wine barrels, and rustic wooden chair-swing adding personality. On the far side is a gazebo which we thought was made for weddings, and a silver airstream which we guessed is a service station when they have barbecues for private events. Apparently Malibu Wines is not a working vineyard - but they do pour two wine labels: Semler (from the vineyard across the street) and Saddlerock. Three tasting flights were on offer: one for each label, and a "Light" flight with combinations of the two. Each consisted of four wines. As it was a hot summer day, we decided to go with the Light flight ($12 normally, but free for us that day with the tokens!) 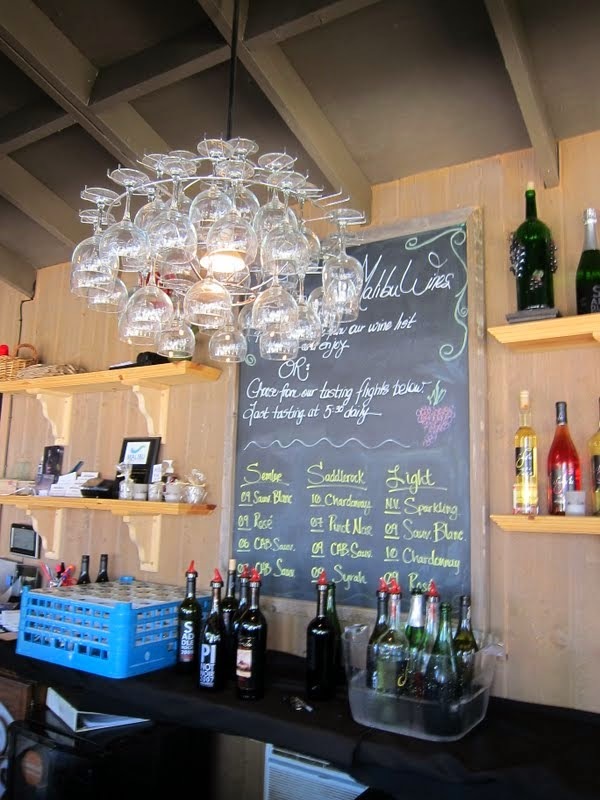 - which included tastings of NV Saddlerock Sparkling, 2010 Semler Sauvignon Blanc, 2010 Saddlerock Chardonnay and 2009 Semler Rose. I am definitely not a wine connoisseur, so not going to attempt to analyze the wines, but to my amateur palate I liked the NV Saddlerock sparkling (Blanc de Blanc) the best - it tasted light and refreshing, pairing perfectly with the gorgeous weather that day! 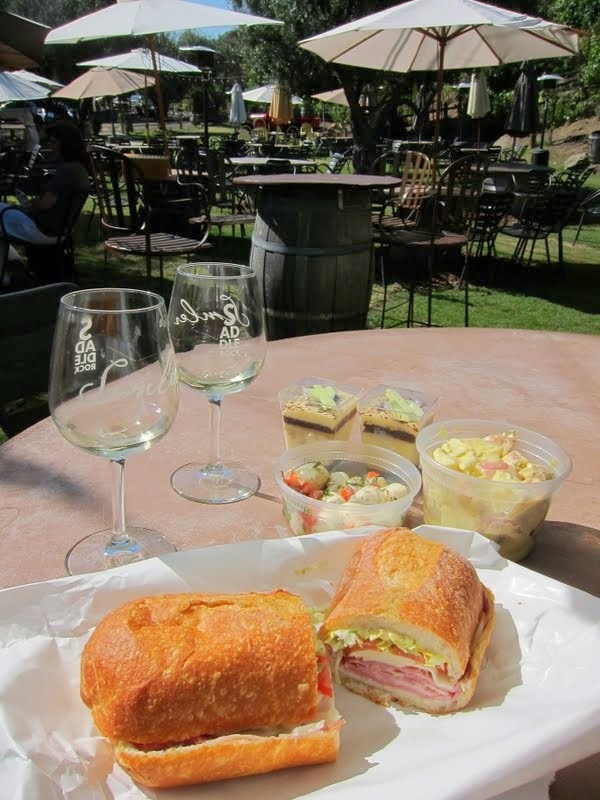 We took our glasses to the picnic area and unpacked our Bay Cities Deli spread: 'Godmother' sandwiches (with genoa salami, mortadella, coppacola, ham, prosciutto, provolone, lettuce, tomato), caprese, potato salad and the cutest single-serving tiramisu cups with plastic shovel-like spoons packed in! Not sure if the sandwich was so named as it represents an offer you can't refuse - but the ingredients and fresh bread really was pretty irresistible! Continuing my roundup of Farmers Markets in LA: Here's one for fellow San Fernando Valley peeps: Gigi's Farmers Market at The Americana at Brand. This is truly a Farmers Market for those already in Glendale who are looking to pickup some farm fresh produce / quick Saturday morning bites - it's no Hollywood Farmers Market nor Studio City Farmers Market in terms of breadth and diversity of offerings, but it's a nice Saturday morning, very accessible source of quick pick-me-ups for those who live/work in/are somehow visiting Glendale. And those who see it as a convenient stop on their way to other entertainment in the area. It's really not big enough to draw anyone else to make the trek from other neighborhoods. Gigi's Farmers Market is held in an outdoor shopping/dining complex similar to The Grove (by the same management company), which makes you feel like you're on vacation thanks to its European vibe (ok so it's like a theme park version of European vibe, but better than your average mall). There's a fountain with water show, charming trolley tracks, and a perfectly manicured park area. Most importantly, because it's in a location where in general no Westsider/ Hollywood folks would venture, Valley girls like me don't have to deal with traffic or struggle to find parking (see #4 on list of things I like about the market). Love that you can also bring your Farmers Market goods from fruits to hot foods for an immediate picnic at the fountain or the park! Like the rest of its grounds, the Farmers Market is perfectly manicured, every booth and nook and cranny around it is pristine (in fact it made me think of the lyrics from the Weezer song "Beverly Hills"). Vegetables, fruits, even hot foods are lined up neatly in enticing displays. 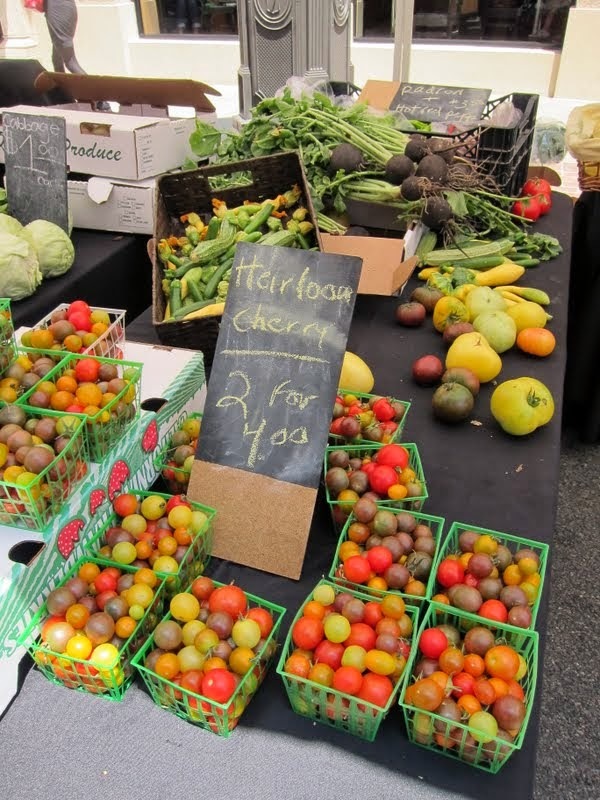 Though there are only a handful of produce vendors, their offerings are high quality, with surprisingly reasonable prices that are mostly comparable to other Farmers Markets around the city. My favorite stall is Country Fresh Herbs (who has been featured on Food Network and recently LA Times) - all of their veggies look perfect - and there are a few items that you don't see at every Farmers Markets in the area, like heirloom cherry tomatoes (2 baskets for $4) and squash blossoms. The lady at the booth is also super friendly, and when I mentioned that the basil smelled amazing, she threw in a handful with my tomatoes! There is also a mix n' match berry stall - strawberries, boysenberries, raspberries and blueberries are on offer in any combo you like, 3 packs for $10. Verni Farms offers peaches and nectarines for $2/lb. 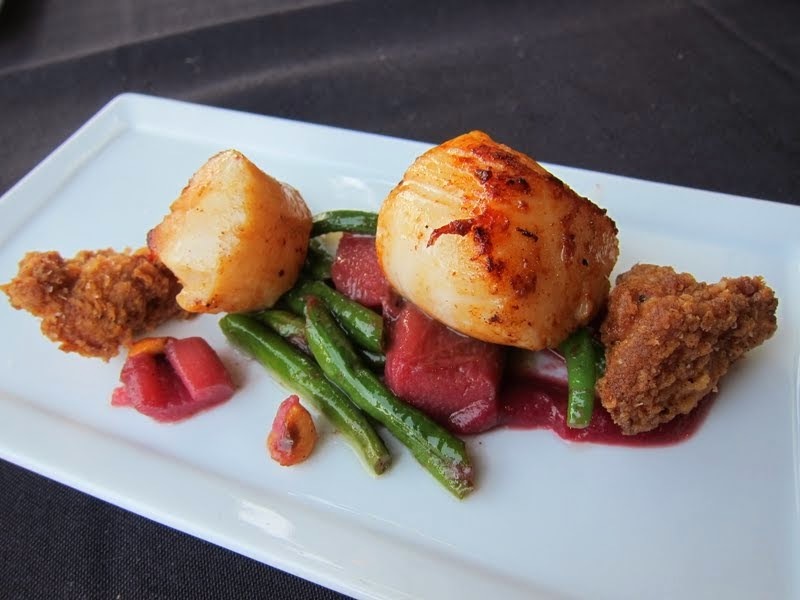 Cafe Pinot - debuting their Summer Farmers' Market menu 3-courses for $39! Prix fixe menu offered for dinner Mondays to Fridays. So the countdown to Carmageddon - the 53 hour closure of the 405 freeway (shut down for 10-mile stretch in both directions between the 101 and 10 freeways July 15 10pm to July 18 5am) begins. I'd previously written about Fun in the Face of Carmageddon. Now lots of deals are starting to pop up for that weekend, to help people and businesses get through the trauma - so thought I'd follow up with a post about the findings! I'm looking forward to using it as a resource once it fills up with listings. In the meantime, here's a compilation of my finds as a start. Don't let Carmageddon tar-nish your social life - there are still plenty of things you can do out of the house - here are a few incentives! Saturday: $25 seafood clambake, beach party, “F-the-405” Beach Brunch 11am-3:30pm $20 bottomless Bloody Mary Bar and Endless Mimosas. The Foundry on Melrose check in for dinner Fri or Sat for $10 off bill, just mention Carmageddon. 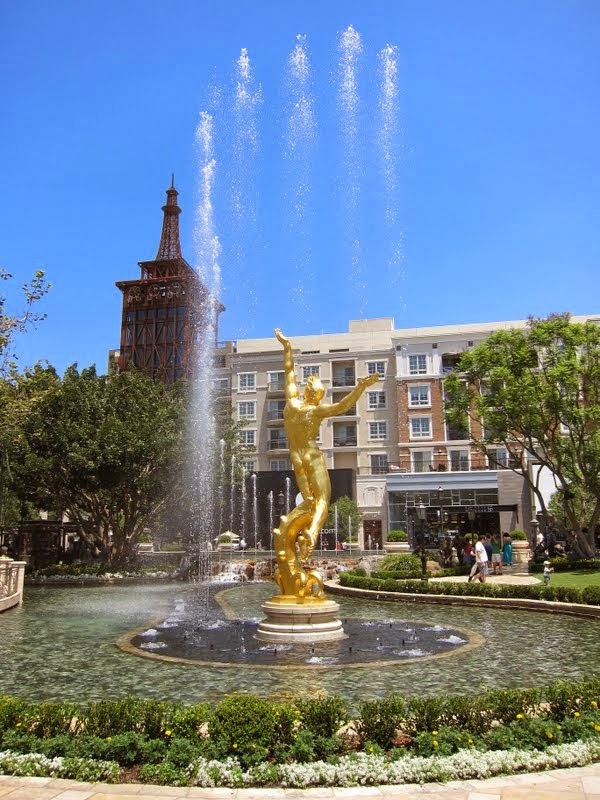 Westfield Century City & Westfield Sherman Oaks Fashion Square July 16 & 17: Shoppers can enter to win the “I Survived the 405” Prize – a $500 gas card, free valet & a car wash once a month for the rest of the year. Additional events, offers, & programs include: Gift card giveaways, live music (12-4pm), free screening of “LA Story” on 7/16 @ 8:30pm. Carmageddon Block Party July 15-17 The Shops at Woodman and Ventura offer food, beverages and special offers by many of the shops (shop at one, get 10% off another). Participating shops include: Melissa Jo Hart’s Sweet Hart’s sweet shop, Freak Beat, NoRoses Gallery and Roni B. and many more. Traffic reports on Sirius XM - has created a dedicated 'Carmageddon' station (Channel 140) to broadcast for 55 hours – beginning at 10 p.m. Friday, July 15 to provide updates to help Los Angelenos navigate through the anticipated mass vehicular chaos. Got a Carmageddon find? Please share here! To kick off the start of a gorgeous long weekend, "Designer" and I decided to take her friend's dog, Stella (she was dogsitting that day) - the sweetest pitbull I've ever met - with us out to dinner. This meant we had to find a place that balanced foodie-friendly fare with dog-friendly patio seating - The Foundry on Melrose fit the bill on both, and when I realized I had an OpenTable Spotlight deal to the place ($110 for 5-course meal for two, with wine pairings!) we knew that's where we were supposed to be that night. Though a fine dining spot, with a beautiful and famous back patio, the restaurant was very gracious in accommodating our trio - dog included - in the front patio, even providing a water dish for Stella. It was a perfect summer evening for al fresco dining - and people watching, from the charming patio with its loungey vibe on one side and casual rattan chairs on the other, framed by planters from which fragrant herbs sprouted. 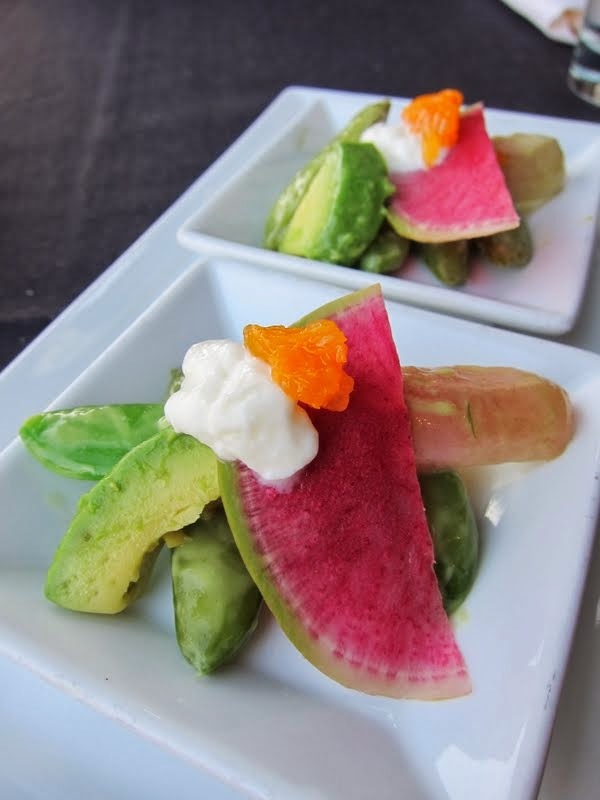 We started with some bread with balsamic vinaigrette spread, followed by an amuse bouche of watermelon radish, avocado, edamame, pickled asparagus, burrata, and tangerine. We loved the unusual mix of veggies, cheese and fruit, the playful presentation and interplay of tart, savory and subtly sweet with crunchy, creamy and buttery. Couldn't have asked for a more refreshing start to a summer meal outdoors! 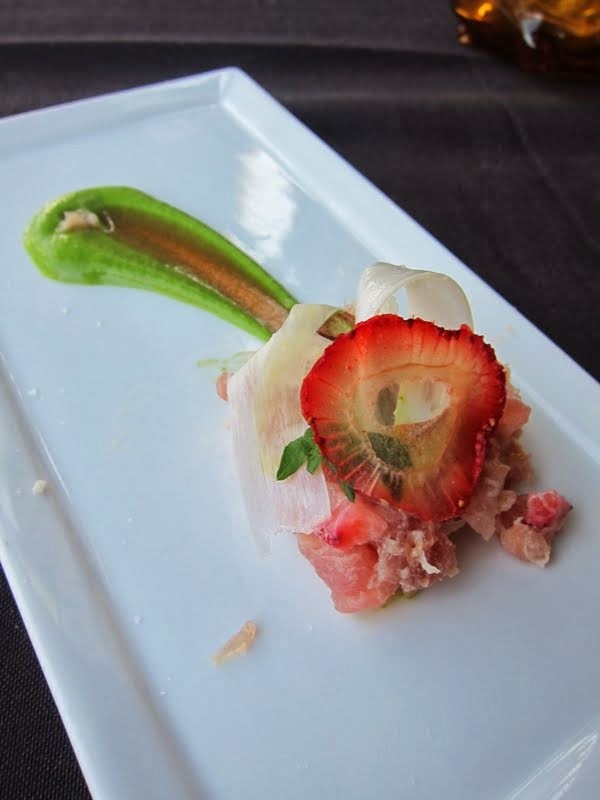 I have to say I've never had Tuna Tartare with strawberries before - in concept it was interesting, with the sweet/tart flavors theoretically a great way to cut through the fatty fish. Again the presentation was thoughtful and quite beautiful - however, we didn't end up loving the combination - the texture of the fish was for whatever reason sort of 'sticky' and clumped together, and though there was just a thin translucent slice of strawberry, for us the rich flavors overshadowed the fish. The scallops were beautifully seared, with crisp shell yielding to a succulent, sweet interior. This is another dish that presented pairings of ingredients we've never seen before - pickled rhubarb not only punctuated the plate with color (along with the haricot vert) but also a subtle tang. This is skillfully counterbalanced by what we could really only describe as fried chicken nuggets - the juiciest ones we've ever had, with dark meat and a perfect flesh to fat ratio enrobed in light, crunchy, flavorful breading. 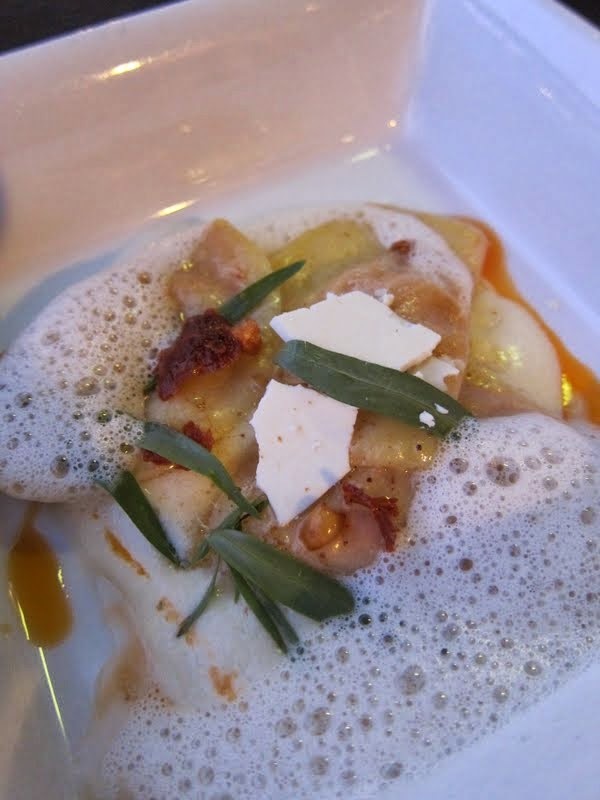 This was an interesting dish, with the chorizo seeping heat into an otherwise mellow pasta dish, and the lime brown butter / foam bringing levity to balance out the hefty flavors of the sausage. 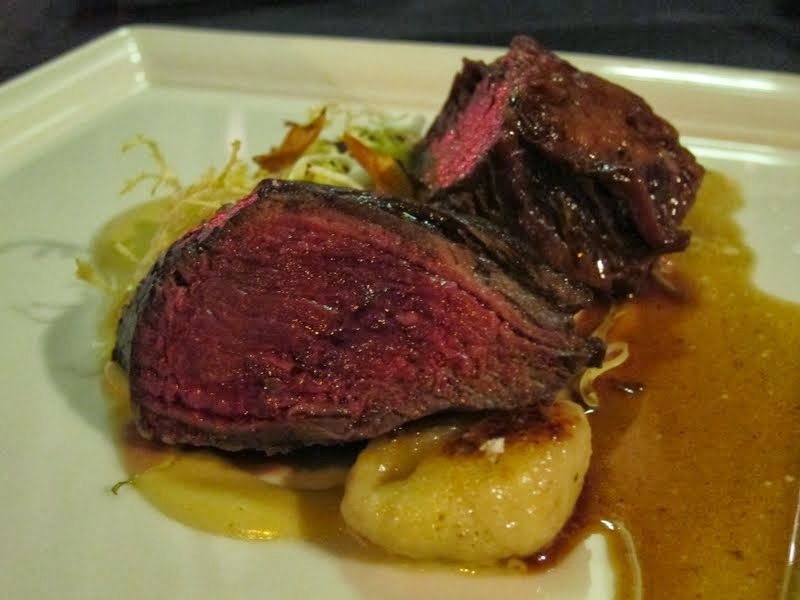 A truly lovely meat course - we realized they didn't ask us how we'd like the steak prepared, which I think turned out great as they simply presented it cooked to their ideal degree and it was fantastic! For the accompanying carb, instead of the standard mashed or baked potato, gnocchi was served after being we think pan fried to get a nice crusty edge. The artichokes and nectarines were we think boiled so that they had the same consistency, but one was savory and one was sweet and added playful dimension to the plate. Designer thought that one of the meat pieces was sirloin, and the other was short rib. All night, Stella had been alternately poking her head up above the table whenever plates arrived, and dunking down on her paws in disappointment every time she was told she can't have 'human food'. When the steak arrived Designer finally made the call to sneak Stella a piece or two - it was afterall her birthday week! Stella couldn't stop licking our fingers long after the meat was already gone. If not for the need to maintain some semblance of decorum, I think we would have done the same. Of all the courses, this one was not a standout. 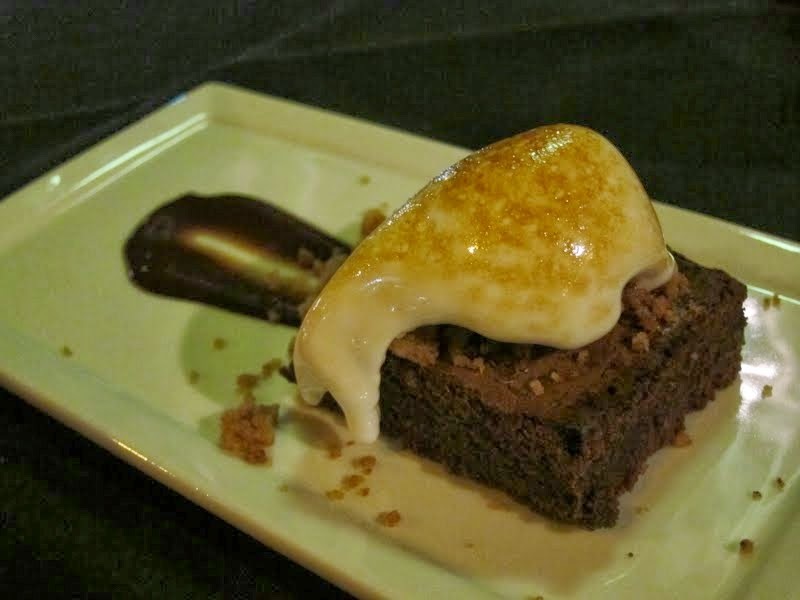 The brownie was not bad, but with the inventiveness of the previous courses, we were expecting something a little more creative. And we didn't get the wine pairing on this last one, possibly as they saw that at least I was struggling to get through my glass from course 4 (though Designer finished hers so they should have at least served the 5th glass to her!). All in all though, a solid meal and truly great deal (thanks OpenTable Spotlight!) at just $55 per person for 5-courses + wines with each course (ok, 4 for us but it should have been 5) before tax and tip. The Chef's Tasting Menu normally goes for $80 per person + $30 for wine pairings. Another lovely thing about The Foundry is their live band - on the night we went it was jazz, but they also offer "Lunes Latino" Mondays, Bluesy Tuesdays, and singers/songwriters Sundays - it makes for a relaxed yet lively and truly enjoyable evening out all around!